Mattie Mattox (left) and Tal Sexton Smith Mountain Building Supply stand with some of their hurricane survival kits on Thursday afternoon. With the severe conditions of Hurricane Florence set to arrive on Friday, do you have your hurricane survival kit? The kids include a compact first aid kit, LED flashlight, size C batteries, a wilderness whistle, a roll of duct tape, kitchen-sized trash bags, 9×12-foot plastic sheeting, dust masks and LED stick-on light switches, all stuffed into a 5-gallon bucket. 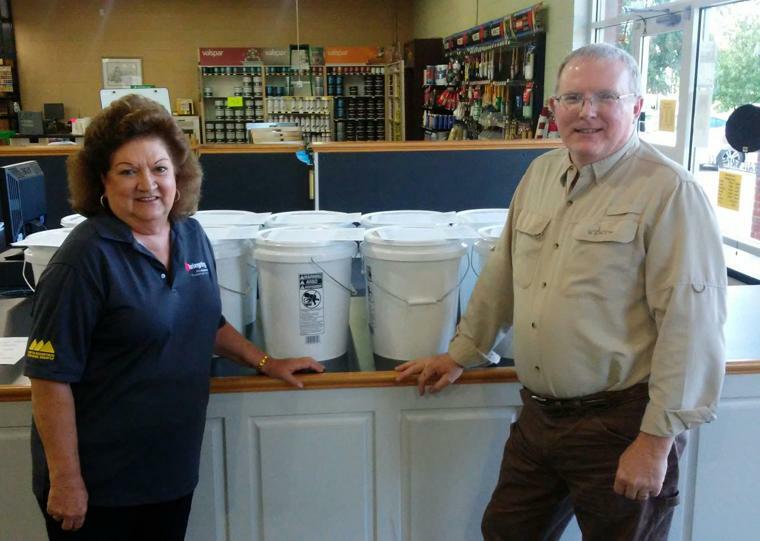 “We bought packs of some of those products, and the ladies who came up with the idea … went to packing up those buckets,” said Tal Sexton, branch manager at Smith Mountain Building Supply. Though most of the items in in the kits are standard emergency-kit far, why include a whistle? “In case you were stuck under something and couldn’t get out,” Sexton said. The hurricane survival kits are selling for $29.95 each, but supplies are limited, Sexton said. According to Meteorologist Mike Sporer of the National Weather Service in Blacksburg, the effects of Florence will start to be felt late Friday in Bedford and Franklin counties. With the current forecasts, there is the expectation of about four to six inches of rain and the possibility of serious flooding as well as downed trees and power lines owing to soggy conditions from earlier rainfalls, he said. While the region will escape the strongest winds, “it will still be pretty gusty at 20 to 40 miles per hour,” Sporer said. In anticipation of the storm, Appalachian Power spokesman John Shepelwich said APCO aims to lower the adjusted level of the entire Smith Mountain Project – which includes Smith Mountain Lake and Leesville Lake – to avoid the possibility of flooding. The project stood at 793 adjusted elevation on Wednesday, and by Thursday afternoon, it was at 792.5 adjusted elevation. Shepelwich said APCO is targeting a level close to 792 and would “stop there,” a level it likely would reach sometime Thursday. “That will give us some storage space in case we get a huge amount of inflow by Monday and Tuesday, he said. Appalachian Power is continuing to track the storm, Shepelwich said. One local school district has adjusted its schedule, but another has no. Franklin County Public Schools announced its schools will be closed Friday. Changes will posted on the schools division’s website, he said. The Virginia Department of Transportation warned that with additional rains forecast to fall onto already saturated soil, flooding could be significant. Heavy rains will not only cause streams and creeks to overflow, but in mountainous terrain, as flood waters rush to low-lying areas, conditions can change rapidly, damaging homes and businesses and hindering emergency response times. Several local events, such as the Antique and Classic Boat Show, SML Walk to End Poverty and Booker T Washington Monument’s Harvest Time Festival, have been either canceled or postponed in anticipation of inclement weather. Be aware of areas where flood waters have receded and watch out for debris. Floodwaters often erode roads and walkways. Never drive or walk through water flowing across a road. It takes only six to 12 inches of water to float a small vehicle.